Yoga is an art, a poetry that can be sung by anyone with passion and determination. It is a way of life which we don’t give many credits to. But it has its advantage to grow and give us quantifiable benefits. One such signified form of yoga is to Mala Beads which many people might not even know about. 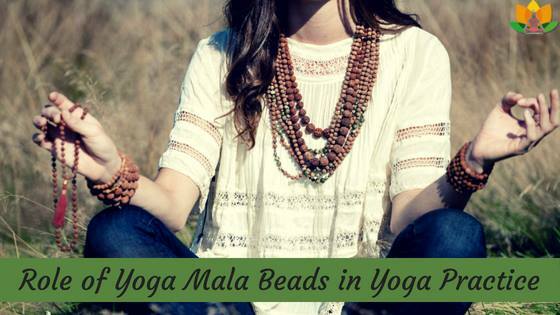 Using mala beads in your yoga practice can have an entirely different effect on any individual. Mala beads are created so that people can perform a spiritual form of yoga and serves as a reminder of their own intention. They are like neckpieces that come into play for over 3000 years back in the Buddhism, Hinduism, and many more roots. This all in the combined structured formed the yoga asana practice. It is a Sanskrit form of the word meditation garland. These beads are used immensely for the Japa is a particular form of meditation in which the mantra is enchanted for 108 times. The phrase or word will help you to keep your focus on the single task and will make your intentions clear of any of the doubt. There is a total of 108 beads (109 often) in a large crystal like form or semi-precious stone known as Rudhraksha that add an aura of spirituality in people with the crystal healing aspect. Each and every bead out of 108 holds a different meaning. 108 line of energies that help in converging the heart chakra. Such as self-realization path of heart Sushumna. 108 Upanishads, wisdom texts composed of the ancient sages. 108 marma point that is said to be the sacred points of the body. Even the distance between the moon and sun to the earth on average is around 108 times their diameters respectively. The history and Significance of Mala Beads in Yoga are enchanted. It will keep you hooked to your place without any sense of movement or need of fury. The calmness and peace will spread out in your whole body keeping your concentration and focus on a single point. There is a saying that one must wear a mala for 40 days consecutively to develop a bond with it. The Mala beads are said to absorb energy and cleanse the body, mind and soul of an individual. The best things are that there is nothing as a right or a wrong way to do mala japa or for using the beads for spiritual practice. However, it is believed that if you wear your mala bead around your neck or even clasp it on your hands, then you will a sense of security and calmness around you. While chanting you need to take one bead at a time and recite a mantra to it before moving to the next one. The Meaning of Mala Beads is so big that it won’t be possible to express it at once. It can only be felt. i really like this article.. it is very useful for those who want to start their spiritual journey with a scientific way! !